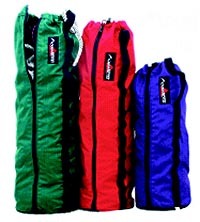 Our highly functional ROPE BAG is easy to stuff… just loosen drawcord and unzip part way. Double sliders provide access to either end of rope (great for glacier travel) or bag’s entire contents. Travelling light? - clip a runner to the daisy chain for easy shoulder carry. Indespensible for organizing big wall gear, extra hardware and food supplies. Made in California. $10 off with Rope Purchase.